Gunshot wounds of the brain constitute approximately one-third of all fatal gunshot wounds. Wounds of the brain from centerfire rifles and shotguns are extremely devastating. Such injuries are described in Chapters 7 and 8. This section will deal with gunshot wounds of the brain caused by low-velocity weapons — handguns and .22 rimfire rifles. When a bullet strikes the head, it "punchesout" acircular to oval woundof entrance in the skull, driving fragmentsof boneintothebrain. Thebone chips generally follow along the main bullet track, contributing toitsirregular configuration. Sometimes the bone chipscreatesecondary tracksthatdeviate from the main path. These chips are detectable on digital palpation in approximately one-third of gunshot wound cases of the brain.13 Use of high-resolution x-ray increases the percentage detected. The presence of bone chips at one end of the bullet track through the brain provides conclusive evidence of the direction of the shot; in the author's experience, no bone chips are found in the brain parenchyma adjacent to the exit wound. This fact is of help in cases of perforating gunshot wounds where there has been surgical debridement of wounds in the skin and bone and where it is important to differentiate the entrance from the exit. As the bullet perforates the brain, it produces a temporary cavity that undergoes a series of pulsations before disappearing. The pressure waves in the brain in the case of high-velocity missiles may produce massive fragmentation of the skull. In the case of handgun bullets, the pressure waves are considerably less but still may cause fractures. Linear fractures of the orbital plate are the most common because of the paper-thin nature of the bone. Fracture lines may radiate from the entrance or exit hole or even be randomly distributed in the vault or base of the skull. These secondary fractures of the skull are seen most commonly with medium- and large-caliber handguns, though they occur even in distant .22-caliber Long Rifle wounds. No matter what the caliber, secondary fractures are more common with contact wounds, where the pressure waves from the temporary cavity are augmented by pressure from the expanding gas. In many handgun wounds of the head, the bullet is retained either in the cranial cavity or beneath the scalp. Whether a handgun bullet is retained or exits is dependent on: the caliber of the weapon; the construction of the bullet (lead, semi-jacketed, full metal-jacketed); the range and the site of entrance. As the caliber of a bullet increases, the likelihood of its perforating also increases. Full metal-jacketed bullets have a greater tendency to perforate the head than lead or semi-jacketed bullets of the same or approximately the same caliber. Distant wounds are more likely to produce penetrating wounds rather than perforating wounds; contact wounds, perforating rather than penetrating. A bullet entering the skull through the thick occipital bone is less likely to exit than a bullet entering through the thin temporal bone. Thus, a contact wound of the temple, from a .357 Magnum handgun, firing a full metal-jacketed bullet, should result in the bullet exiting while a distant wound of the occipital area, from a .22 lead bullet, should result in the bullet being retained. Table 9.3 shows the percentage of bullets exiting the head in relationship to caliber, range, bullet construction, and site of entrance. Virtually all the suicidal wounds were contact, with the vast majority entering the temple region, while most of the homicides were distant wounds with the location of the entrances randomly distributed. All the .22 caliber bullets were lead; the .25 ACP's full metal-jacketed and the .357 Magnum's semi-jacketed hollow-point or, very rarely, soft-point. The 9 mm's were predominantly full metal-jacketed; the .38 Specials mostly semi-jacketed hollow-point, occasionally lead roundnose. The exact distribution of bullet styles for the 9 mm's and .38 Specials could not be determined because not all the exiting bullets were recovered and in some cases different bullet styles were used in the same gun. Table 9.3 confirms the previously noted assertions in regard to caliber, bullet construction, range and site of entrance. In suicides (in which wounds are virtually always contact and predominantly in the temple), the bullet exited 51% of the times compared to homicides (predominantly distant wounds, randomly distributed over the surface of the head), where the bullet exited in only 19.9% of the cases. These observations are true even if one compares the percentage of exit for suicide versus homicide for each caliber individually. With the exception of homicides with the .357 Magnum, as the caliber increased so did the tendency for a bullet to exit the head. Of the bullets that do not exit the head, the vast majority are retained in the cranial cavity. Thus, internal ricochet is fairly common, occurring in anywhere from 10 to 25% of the cases, depending on the caliber of the weapons and the diligence with which the evidence of internal ricochet is sought. As a general rule, internal ricochet is more commonly associated with lead bullets and bullets of small caliber. Thus, ricochet within the cranial cavity occurs most commonly with .22 lead bullets. The type of ricochet most commonly encountered results from a bullet that passes through the brain, strikes the internal table of the skull on the other side, and is deflected in a cortical or subcortical path parallel to the internal table. This results in a shallow gutter wound track in the cortex of the brain. Less commonly, bullets ricochet back into the brain at an acute angle or along the original bullet track (Figure 9.2). 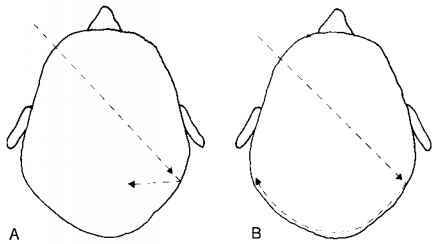 Figure 9.2 Patterns of bullet ricochet inside cranial cavity. Type B is the most common. The length of the internal ricochet track may be quite long. In one case, a .38 Special lead bullet entered the right frontal lobe, perforated the brain, exiting the left frontal lobe. The bullet then ricocheted off the bone traveling along the lateral aspect of the left frontal, parietal, and occipital lobes; crossed the midline; and continued along the lateral aspect of the right cerebral hemisphere, coming to rest in the lateral cortex of the right frontal pole adjacent to where it had entered. Examination of the brain in gunshot wounds reveals contusions around the entrance site in about half the cases.13 These are probably due to in-bending of the bone against the brain at the moment of perforation. Contusions are equally frequent at the exit, although they do not necessarily occur in the same cases as entry contusions. Contusions can also be seen on the inferior surface of the frontal lobe.